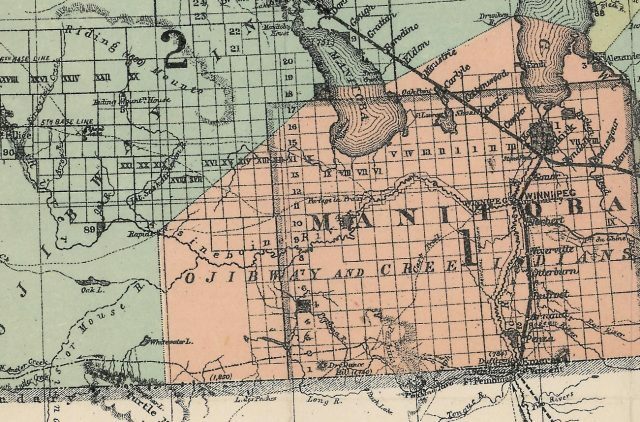 This portion of an 1877 map showing the boundary between Treaty 1 and Treaty 2 shows "Rapids" marked on the Assiniboine River. Treaty No. 1 was signed on Aug. 3, 1871, at Lower Fort Garry, and is sometimes known as the Stone Fort Treaty. A few of the Canadian communities that share in obligations and benefits of Treaty No. 1 include: Winnipeg, Portage La Prairie, Killarney, Selkirk, Steinbach, Emerson and Winkler and many more. The First Nation communities that entered into Treaty No. 1 are: Brokenhead, Long Plain, Peguis, Roseau River, Sagkeeng, Sandy Bay and Swan Lake. Treaty No. 2 was signed on Aug. 21, 1871, at Manitoba House, and is sometimes known as the Manitoba Post Treaty. A few of the Canadian communities that share in obligations and benefits of Treaty No. 2 include: Brandon, Dauphin, Melita, Minnedosa, Roblin, Virden and many more. The First Nation communities that entered into Treaty No. 2 are: Dauphin River, Ebb & Flow, Keeseekoowenin, Lake St. Martin, Lake Manitoba, Little Saskatchewan, O-Chi-Chak-Ko-Sipi, Pinaymootang, and Skownan. Riding Mountain National Park and Duck Mountain Provincial Park are within the Treaty No. 2 area. Brandon University sits on Treaty No. 2 land and in 2008 signed an MOU to become a formal partner with the Treaty Relations Commission of Manitoba in promoting awareness and understanding of treaty-related issues. Despite being mostly forgotten, a local landmark continues to play an important role in defining treaty relationships in Canada, says a Brandon University (BU) researcher who is working on a documentary about the Grand Rapids of the Assiniboine River. Tom Mitchell, Archivist Emeritus at BU, says that the Rapids, including the Landing downstream of them and the Crossing upstream, were natural landmarks in an era before railroads and then highways spread across the Prairies, and the Crossing was key marker in delineating the borders of Treaty No. 1 and Treaty No. 2, which includes the city of Brandon. Now, with Aug. 21 being the 145th anniversary of the signing of Treaty 2, Mitchell hopes that resurfacing the memory of this once-essential prairie waypoint can help modern understanding of the political and geographic realities of the time. Chris Lagimodiere, Director of the Indigenous Peoples’ Centre at Brandon University, says that the importance of the treaties continues to reverberate today. On maps from the 1800s, pre-dating the founding of the city of Brandon, Mitchell points out that the Rapids are marked clearly, one of the most obvious features in the region, a natural crossing point on the Assiniboine River about midway between where it is joined by the Little Saskatchewan and the Souris. As fur traders and European explorers followed the traditional Aboriginal and later Métis trails across the Prairies, they also adopted many of the same landmarks, including the Grand Rapids. But while the Grand Rapids were prominently marked on maps for decades, when it came time to film his forthcoming documentary, Mitchell had to do some sleuthing to track down the actual location of the Crossing. Luckily, members of the Canadian Geological Survey and Hudson’s Bay man John Rae recorded precise details of their journeys through the area, including directions and distances to and from other landmarks (such as Portage la Prairie) and coordinates of latitude and longitude. These furnished data to fix the location of the Crossing. No bison or cart trail leads to the Crossing these days, but there is still the gentle slope and shallow water that makes for a natural crossing above the Rapids. Although Mitchell notes that much of the landscape has changed — including portions of the river — there’s much that is still very much the same as it was for generations. And, the Crossing above the Grand Rapids retains its importance as a border marker for Treaty 1 and Treaty 2, which were signed 145 years ago this month. Treaty 1, Mitchell explains, includes a boundary from a point on the west shore of Lake Manitoba that is defined as “thence in a straight line to the crossing of the rapids on the Assiniboine; thence due south to the international boundary line,” and Treaty 2 includes the same border but encompassing lands on the western side, including the current city of Brandon, and stretching to Moose Mountain in southeastern Saskatchewan. That makes the precise location of the “Crossing of the Rapids” on the Assiniboine River of more than historic and academic concern, he points out. He says even a simple cairn, with information and a map that he would be happy to provide, could bring attention to the significance of the site, and could provide valuable perspective to visitors while also hopefully piquing their curiosity to learn more.